FreedomVoice is a California-based company that has been serving over 200k entrepreneurs and small businesses for decades. Despite being a subsidiary of GoDaddy, which acquired the company in 2016, FreedomVoice still provides the quality service it is known for with over 40 different features available for both residential and business users. By becoming a user of this VoIP service provider, you can get almost any kind of phone numbers and features – whether you want to use your phone system for residential or business purposes. You have the option to purchase extra features like professional greetings, call recording and the ability to get your voicemails read to you, and you can integrate different softphones into your system without hassle. Your system can be managed from a simple, straightforward and fully customizable account manager and the free iPhone/Android app that lets you bring your business with you. FreedomVoice is available in three barely different pricing plans with a 30-day free trial and without contractual obligation. Whether you use the services of FreedomVoice for residential or for business purposes, the list of features is quite impressive. Even though 3-way conference calling is only available if you choose CloudPBX and call recording costs an extra (see info later), simpler features like call forwarding are available in an advanced form: the above mentioned forwarding is accompanied by an advanced follow-me find-me function (call hunting) for which you can set the exact time when you want your calls to be forwarded and to which number. You can also set up a group of people whom a certain call will be forwarded to and you have the option to evenly distribute calls between your employees. Thanks to the unlimited line capacity and the also unlimited number of extensions – by default that number is 10 –, your callers will never hear a busy line again. 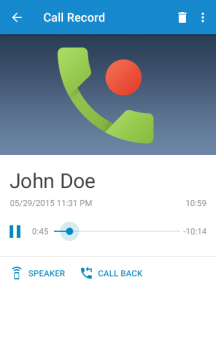 Speaking of callers, you can do several things with incoming calls. 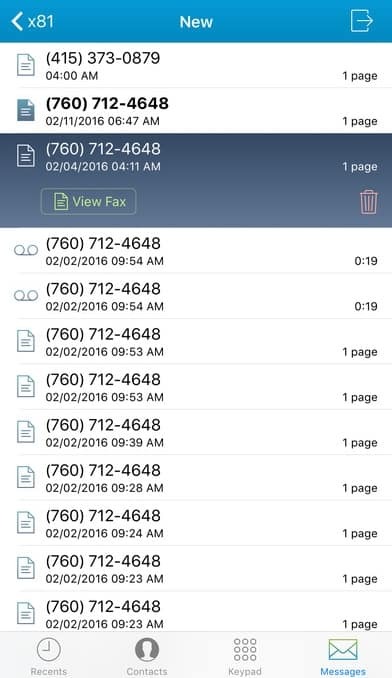 You can simply block a number (because unlike your caller ID, the callers’ are always displayed) or put your caller on hold/in a queue (to hear a nice hold music). You can also send him/her right to voicemail, transfer the call to someone else or forward to the right person immediately or even ask your callers to tell their names so you can decide whether to answer them personally or not. Your callers have several options as well: they can spell the name of the person they want to reach and get connected immediately, go through answering rules you have created and get faxes you have uploaded to your storage with a push of a button. FreedomVoice’s account manager is very logical: the main screen emphasizes those subpages which you will use the most (messaging, settings and user management), but those functions and everything else can be reached from the tabs on the upper part of the screen too. 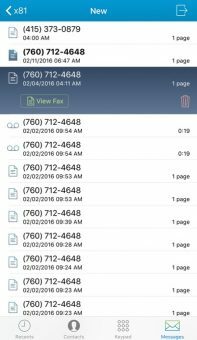 This way you can easily check out your call logs and reports, and set up things like the on hold music, the auto-attendant, the greeting and what you want to do with your voicemails and faxes. Speaking of the latter, the messaging section is the most important part of your account, as this is the place where you can set up unlimited voicemail boxes in which all your voicemails and faxes will be stored to be read/listened to. However, you have the option to listen to your messages through a regular desk phone, forward them immediately to a predetermined email address, and even transcribe them to readable format (although this is an extra). As FreedomVoice provides unlimited extensions, you can add as many users to your phone system as you want (however, for more than 4 users, subscribe to CloudPBX). You can make some of them administrators just like you to further distribute tasks and/or allow other users to customize the system the way they want to, like adding a softphone (Bria or X-Lite) to the system. This, however, requires a bit more expertise, as you not only have to know the exact manufacturer and name of the software, but you also have to type in the MAC address of the phone system you are using. Like many other VoIP service providers, FreedomVoice also offers the option to replace the dull, default auto-attendant greeting by fully customized ones, read by professional voice talents. They can read your greetings in English, British English and even in Spanish. However, this feature is an extra and it doesn’t have fixed prices, therefore always consult a FreedomVoice staff member before using this service. The same cannot be said about name/address capture, because it does have a fixed price: for $0.10 per occasion you can look up your caller’s name and address for any purpose you want. 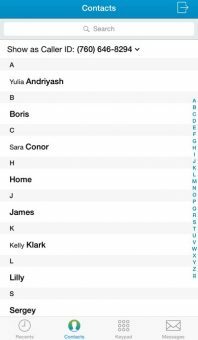 Such a purpose for instance is voice broadcasting, another special (yet free of charge) feature with which you can send prerecorded voice messages to a list of predetermined numbers. Due to the limited storage space that comes with each subscription (2GB per system), you have the unique option to compress your voicemails to a smaller size and send them right to your email address. Furthermore, you don’t have to worry about unwanted “guests” peeking into your messages: you can set up password protection for your voicemails, therefore only those in possession of the password can hear/view your messages. Unless you want an international number, FreedomVoice will completely satisfy all your expectations regarding phone numbers. You can even port your number from your current phone service provider, but keep in mind that doing so will cost you an extra $30 setup fee – a fee that is normally waived if you pick a new number. Speaking of new numbers, you can select a local number of the U.S., Canada, Puerto Rico and the U.S. Virgin Island, but you have to know the area code when signing up. You can also select a toll-free number with 6 prefixes (including 800). 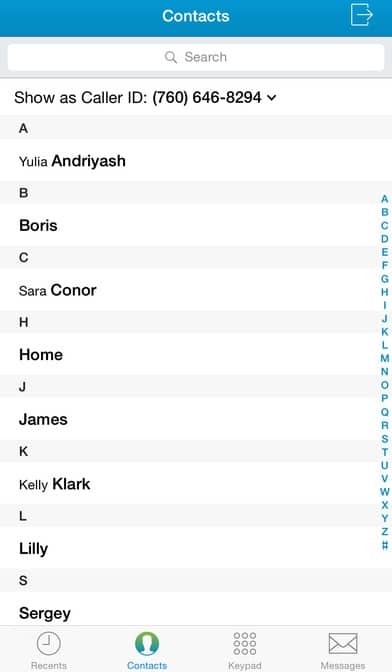 Vanity numbers are also available with FreedomVoice (with 2–3 fixed prefixes) and you have the option to use wildcard characters. However, with the exception of local phone numbers, you have to pay a one-time setup fee of $30 for each number – but thankfully only after the 30-day trial period. As FreedomVoice is unavailable from mobile browsers, the only way to enjoy the company’s services from your smartphone/tablet is by downloading the free app, available for Android or iOS devices. Thankfully, no matter what kind of device you own, both apps are completely identical regarding their main features: you can place calls using your FreedomVoice caller ID, thus separating business calls from your regular ones. You also have the option to manage your voicemails and faxes from your phone by checking/listening to them. The app is capable of the so-called one-touch contact, meaning that you only have to search for your contact and you can already call him/her with a single tap on the screen. However, by far the most interesting feature is the 3-way conference calling which is not available for residential plans: you can initiate two calls and then simply use the merge option. A business management platform that fully integrates business-process automation, help desk services, marketing, sales, business analytics and project management. This software, available for all platforms, is capable of HD calls, 3-way conference callings, hiding your caller ID, instant messaging, indicating your missed calls and many more. Basically the toned down version of Bria that has the most necessary features like basic voice and video calling, instant messaging, call lists and history, and voicemail support. The pricing policy of FreedomVoice is extremely straightforward – if you choose the basic plans. This means that if you want to set up a purely business related phone system (CloudPBX), which more or less has the same features as the basic ones, you have to turn to FreedomVoice. FreedomVoice has 3 plans with all features, unlimited lines and a 30-day free trial. Start is just $9.95 per month with 400 included minutes, followed by Edge which is $19.95 per month with 1,200 included minutes. The top plan is Suite with 3,000 included minutes for $29.95 per month. However, there are some extra charges. Overage minutes are $0.039 per minute, while desk phone rental is free or $2/$5 per month (depending on the phone). Each subscription comes with 2GB storage space for your media files, but if you need more, you have to pay $9.95 per month per each additional 2GB. You can transcribe 60 minutes of voicemail into readable format, but each extra 30 seconds is $0.025. To learn your caller’s ID if you missed a call, you have to pay $0.01 per occasion, call recording is $5 per month while voicemails are read to you for $10 per month. 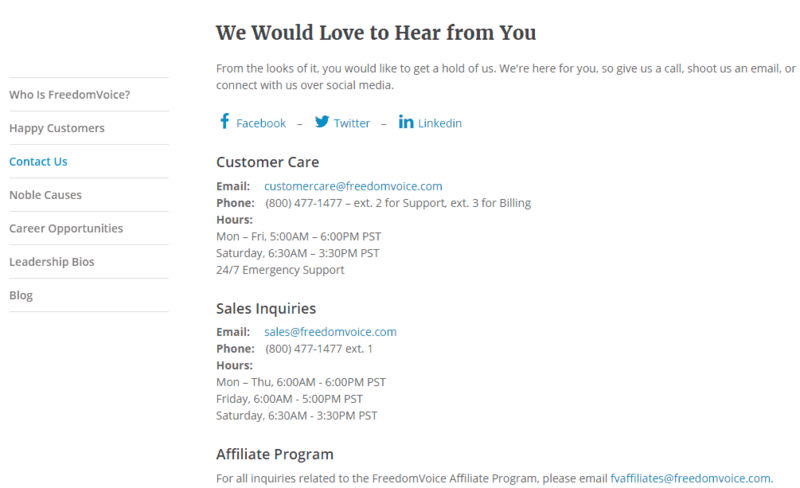 FreedomVoice’s customer support is not very spectacular, but at least it is available for quite a long period of time. If you need general or sales related help, you can call the company’s staff for free from Monday to Saturday, or you can send an email. The customer support is not 24/7, but they maintain an emergency service, so if your problem is serious, you can contact the staff any time. There is also a Facebook and Twitter page that FreedomVoice uses for advertizing purposes, and a YouTube channel for video tutorials. 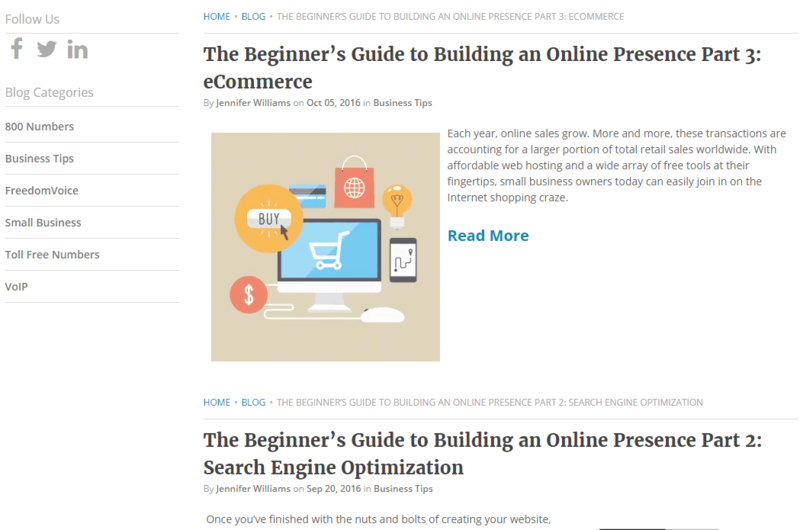 FreedomVoice also maintains a regularly updated blog where you can read useful business tips, learn how to use your vanity/toll-free number in a way that earns you profit, and be informed about the latest news regarding the company. Quite interestingly there is also a VoIP speed test page with which you can see whether you are ready for VoIP and if yes, will calls be of high quality. However, this feature requires Java, therefore browsers without Java (especially Google Chrome) will display nothing. FreedomVoice is definitely a company that can provide quality services for both residential and business users. Thankfully, there are very few problems: maybe the biggest one is that business pricing plans are only available if you contact the company. We think that certain features like call recording, voicemail transcription should be included in your subscription and asking a setup fee for everything except new local numbers is a bit questionable. Furthermore, the limited 2GB of storage space for voicemails and faxes is far from ideal. However, the features list, whether we include extras like professional greeting, call recording etc., is pretty impressive compared to the competition. And for the above prices, very few companies can tell that they allow you to freely integrate with the market’s best third-party softphones, get unlimited voicemail boxes and an account manager and iPhone/Android app that is easy to use and understand. This is a pretty good deal to me, I’m saving $30 per month on my phone expenses since I switched to FreedomVoice. I needed some help setting it up, but it was worth the switch. 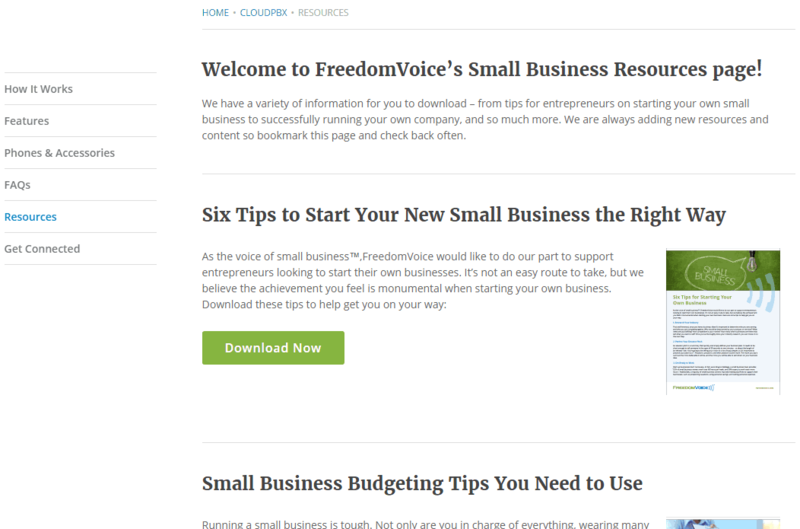 I signed up for Freedom Voice and was unable to get my company name on the Account settings. Sounds simple enough, called their customer service desk and asked “please add my company name to billing and account information” as I was unable to do this from the web portal. After talking to four people over 5 days I was told it was still being worked on and that it would be a few more days….if they can’t take care of something this simple I would hate to run into real trouble with them….so I have cancelled my account and in my opinion this is a very poorly run company with bad customer service. Do not use Freedom Voice !!! !